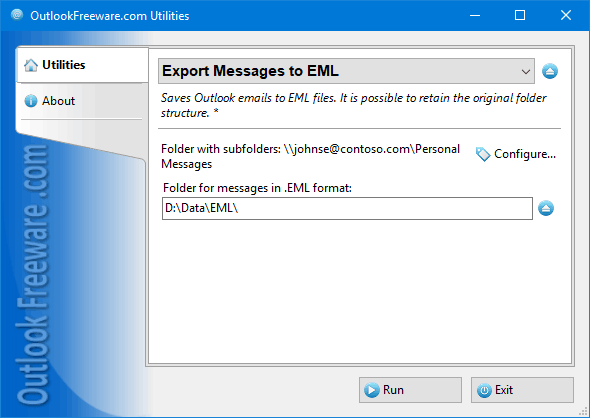 Free and easy way to export messages from specified Outlook folders to EML format files. It is possible to retain the original folder structure. This utility can also be used to export messages to Windows Live Mail, Mozilla Thunderbird and other email clients that supports EML format for email files. The product provides both standalone application and Outlook add-in. Auto Mail Sender Birthday Edition (AMSBE) is designed to send birthday wishes and season`s greetings (cards or messages) automatically, just do a little settings, you can get a convenient tool for sending automatic wishes.